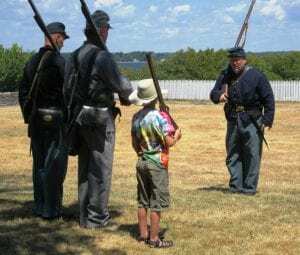 Sackets Harbor Battlefield State Historic Site is set to host “A Common Sailor’s Life During the Civil War” on Saturday August 18th, from 10 am to 4 pm. On Saturday July 29, at the Sackets Harbor Battlefield State Historic Site, a living history event “Sackets Harbor and the Civil War” will bring to life how soldiers lived, what they ate and drank, and what they wore and carried. The public has been invited to see how soldiers lived during the Civil War, shoulder a wooden musket and learn the 1862 military drill. On Monday July 25, at 6:30 pm at the Sackets Harbor Battlefield State Historic Site, Don Hicket will give an evening talk on the war of 1812. 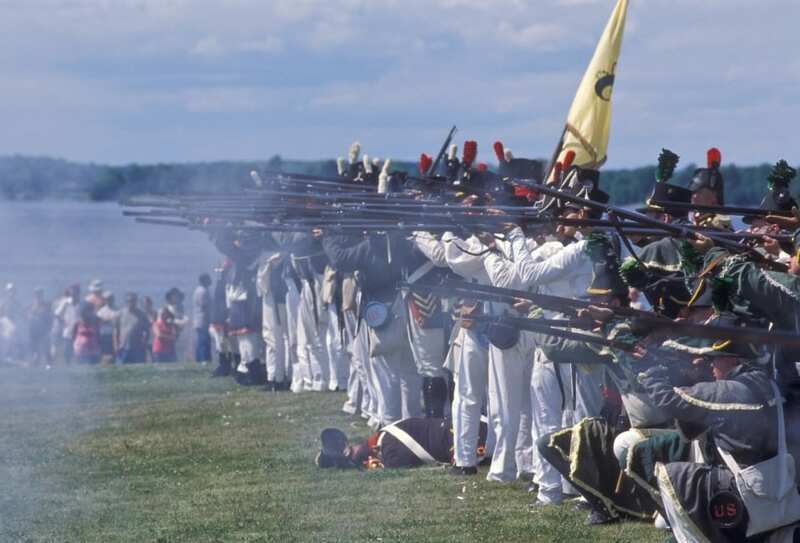 The Sackets Harbor Battlefield State Historic Site will host the 11th Annual War of 1812 Weekend all day Saturday August 1 and Sunday morning August 2, 2015. The War of 1812 witnessed the unprecedented employment of naval power on Lake Ontario. From their humble pre-war beginnings, the dockyards at Sackets Harbor and Kingston grew in scale and by the end of the conflict, were producing ships of a scale intended more for the open ocean than inland seas. This presentation will examine the naval commitment made by Great Britain and the United States on Lake Ontario during the War of 1812 and the legacy of those efforts. This free event will be held on Tuesday, May 29th, 2012 at the Sackets Harbor Battlefield State Historic Site’s Barn on Hill Street, off Washington Street in Sackets Harbor. The annual meeting begins at 6 pm; the program at 7 pm. Light refreshments will be served. 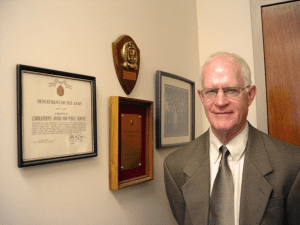 John R. Grodzinski teaches military history at the Royal Military College of Canada at Kingston, Ontario. He is author of Sir George Prevost: Defender of Canada in the War of 1812 (forthcoming, University of Oklahoma Press) and several articles examining various topics related to the War of 1812. Grodzinski is also the editor of the on-line War of 1812 Magazine and conducts staff rides and battlefield tours that consider the Seven Years’ War, the American War of Independence, the War of 1812 and the development of fortifications in Canada from 1608 to 1871. 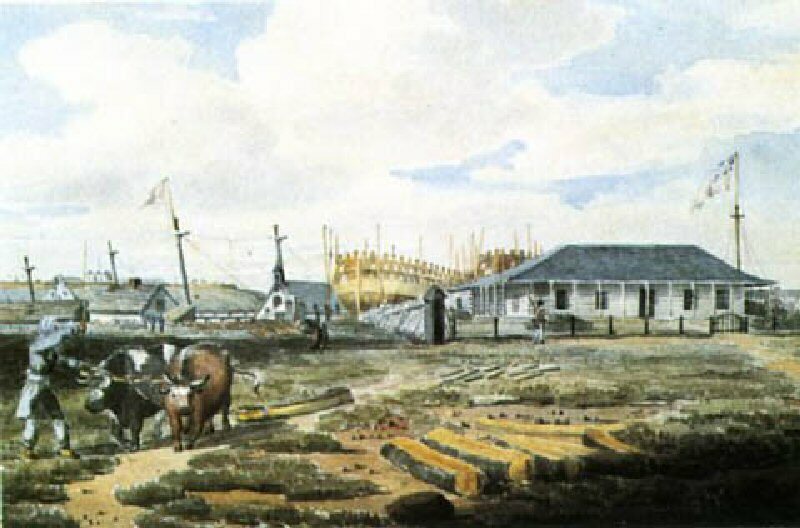 Illustration: The Kingston (now Ontario) naval yard at Point Fredrick in 1815 by E. E. Vidal (watercolor) now hanging in the Massey Library at the Royal Military College of Canada. The Sackets Harbor Battlefield Alliance, Inc. and the Village of Sackets Harbor, New York are proud to host the War of 1812 North American Grand Tactical, July 31-August 1, 2010. 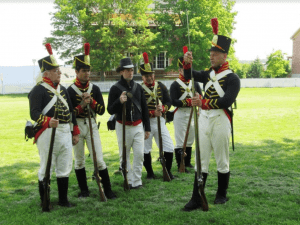 The Grand Tactical is the annual gathering of all 1812 American and Crown Forces recreated units, showcasing a wide range of living history traditions including 1812 camp life, clothing, cooking, dance, etiquette, music, period games, military dress and tactics, and weaponry. One of the largest living history weekends for re-enactors, this is the dress rehearsal for the 2013 Bicentennial living history event scheduled for Sackets Harbor. Grand Tacticals annually alternate between the United States and Canada, attracting large numbers of participants and spectators. This is the first War of 1812 Grand Tactical for New York State’s north country. 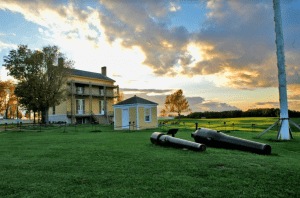 The Sackets Harbor site was selected for its battlegrounds authenticity and ranking by the National Park Service as one of the top ten War of 1812 sites in the nation. Experience life during the War of 1812 as living history re-enactors and sutlers (period merchants) gather at the Sackets Harbor Battlefield State Historic Site. A full schedule of demonstrations fills Saturday from 9am to 8pm and again on Sunday from 9am to 3pm. There is a nominal admission fee. This gigantic Grand Tactical kick-off to the upcoming War of 1812 Bicentennial will give everyone a taste of what’s to come during the three-year cross-border observance starting in 2012.